Paperback, 7.25 x 8.25 in. / 160 pgs / 80 color / 20 bw. Introduction by Roger Malbert. 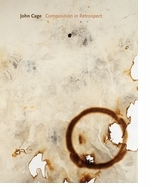 Text by Jeremy Millar, Lauren A. Wright, Helen Luckett. Interviews by Kathan Brown, Ray Kass, Laura Kuhn, Julie Lazar, Irving Sandler. One of the twentieth century's most influential and iconoclastic protagonists, John Cage (1912-1992) may be described not so much as a composer, artist and author, as a thinker who applied his ideas equivalently to sound, visual art and writing. 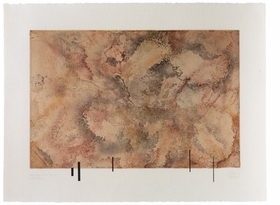 As with his music, the use of chance operations--in particular via the Chinese Book of Changes, or I Ching--was central to Cage's approach to visual art, determining technique, the placement of forms and even tonal values. Every Day is a Good Day provides the first broad assessment of Cage's art, and is fully illustrated with plates of his drawings, watercolors and prints, including series such as Where R=Ryoanji (1983-92). Cage's working methods and philosophies are brought to light in new interviews with key collaborators: printmaker and writer Kathan Brown, founder of Crown Point Press; Laura Kuhn, Director of the John Cage Trust; artist Ray Kass; and Julie Lazar, curator of Cage's composition for a museum, Rolywholyover: A Circus. Extracts from a 1966 interview between John Cage and critic Irving Sandler are also reproduced. 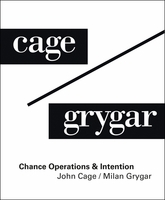 At the heart of the book is a "Companion to John Cage," a selection of quotes by Cage and notes on key themes and influences, all of which make it essential reading on this important figure of the twentieth-century avant garde. "For this image, Cage created twelve plates, and in each print all twelve’s were printed one on top of the other, each plate in a unique mixed colour. All the colours related to those found in smoke, and the plates were etched using smoke as an acid resist. The title derives from the saying, 'Where there is smoke, there is fire.' Cage completed the initial image in 1987, and in 1989, during his next work period at Crown Point, he asked to change the already-printed prints, which he said looks too much like wallpaper….In the changed version, Cage has added a chance-selected scattering of black rectangles (he called them 'buildings') along the lower plate edge of each impression. Each print has a different configuration of rectangles. 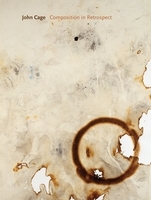 The new titles became Where There is Where There - Urban Landscape." 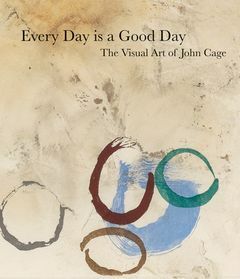 Kathan Brown, excerpted from Every Day is a Good Day: The Visual Art of John Cage, from which this image is reproduced. "What, then, is my position here in relation to this exhibition? Perhaps it is somewhat similar to that of Cage in relation to his own works: that of an interested participant-observer. When Cage exclaimed in the studios of Crown Point Press, or Mountain Lake Workshop…that the work on which he was working was 'Beautiful! ', it was not with arrogance, since he did not consider himself responsible for what was occurring on the paper before him. Instead, this was the result of a series of chance operations, and while he mat have determined the process at work, he could scarcely determine its outcome. Chance operations allowed Cage to be free (or more free, at least) from his prejudices and here, largely, it has liberated me from mine. I might delight in a particular section of a particular exhibition above all others, just as Cage may have delighted in a particular combination of sounds, shapes, or colours, but such delight would not be laced with self-satisfaction." Jeremy Millar, excerpted from Not Wanting to Say Anything About John Cage in Every Day is a Good Day: The Visual Art of John Cage. Edited by Beate Reifenscheid. Text by Jean-Yves Bosseur, Hana Larvová, Suzana Leu. FORMAT: Pbk, 7.25 x 8.25 in. / 160 pgs / 80 color / 20 b&w.